Everyone loves a great story with a great ending. (i.e. The Apollo 13 crew was saved from death; Lewis and Clark made it to the Pacific Ocean). Even with a story with a bad ending we will find a way to gloss it over to make it sound like out of all the pain or loss, there was something good that happened. (i.e. Vietnam war, Khmer Rouge in Cambodia—I know it is a huge stretch to find anything good.) I am a Christian because I know that Jesus helps me in amazing ways and he will help anyone. I have seen Jesus do miracles with people’s lives even though they don’t even believe in him or worse yet, despise him. Last year I took a struggling young minister on a short motorcycle trip. I took my son with me also. What I wanted to show them was how you can help people without making a project out of it. You can really minister to people’s needs just in the course of your daily activities. Just out of random acts of kindness you can help change their whole life’s destiny. On a hot day last year a “minister in training” named Simon with my son and I headed out. We had no plan and no intended destination. We just drove on our motorcycles wherever the road and our curiosity took us. Along the way we met a family who was walking when their motorcycle chain broke. We gave the wife and three kids a ride to their home village while the father fixed the chain. After driving for many hours we arrived at the very end of a road. It was on the edge of the jungle. There people there were living in complete poverty. The family we assisted had come to give a sacrifice to a witch-doctor. The village was called “Kroach Village” which means “Oranges”. I did not notice any orange trees though, just jungle. After that brief encounter in the village we made friends and the young minister came back the next week to get to know them more. One family decided to believe in Christ, then another, and then another. Now a year later, there is a nice little church in that village. Another minister, Ang, is helping to teach the people in that village. He teaches the Bible, but he also teaches animal husbandry and how to grow vegetables so they can provide for their families better. 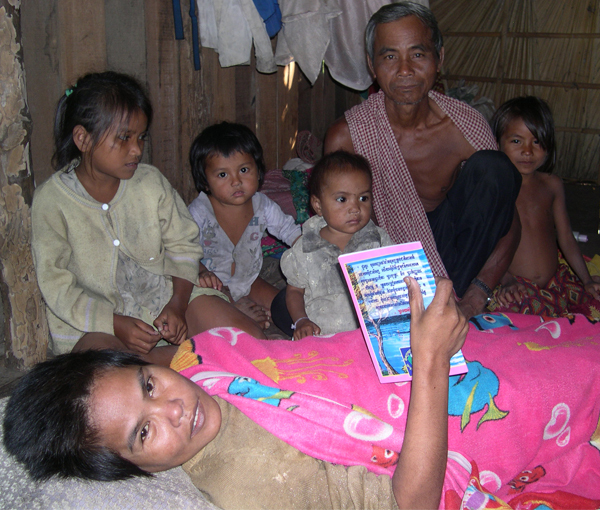 One of the families, the family of Narin and Srey Pouw with their four children, is facing a dire need. They are desperately poor and have no cash money what-so-ever. Srey Pouw is sick. She went to a doctor a few months ago and they told her she has a blood disorder and will die soon. She has no money for treatment and the doctors told her she would not survive even if she did have money. Srey Pouw is unable to sit up and just lies in her hot village hut which is made from bamboo. It is at these times that I feel most helpless, yet it is at these very times that Jesus does his handiwork. I have seen Jesus heal myself many times. I have seen Jesus heal people thousands of times. I find he loves to heal those who are most desperate, people like Narin and Srey Pouw. Today, one of the ministers is going to pray for them. I expect God is going to do a great thing in their family and in their village. It was not by accident that God led us to “orange village” a year ago. God knew that Srey Pouw would need his love and his power. Believers in Jesus are asked to join with those in need and pray for them, so would you give a prayer for Srey Pouw today. Jesus hears you no matter where you are or no matter what language you speak.